Hey. This is so good! 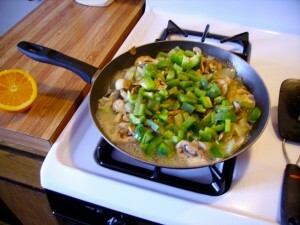 I quick stir fried onions, celery, mushrooms and green peppers. Squirted them with fresh orange juice. Added a can of black beans. Tossed it all into a whole wheat tortilla topped with some low fat cottage cheese and a handful of walnuts. The walnuts are new to this combination, and so fun and delish. So crunchy! As I typed this Hubby yelled down to me, “What’s for dinner?” and when I told him he said he was tired of having to choose between TV dinners or health food. I had already cooked deep fried French toast and cheesy scrambled eggs for him for breakfast, so yah, I guess it’s TV dinners for him. Sorry. I just can’t do both. I can’t take care of me and him at the same time.